The Congressional Gold Medal will honor the four girls killed in 1963 when their Alabama church was targeted by white supremacists. 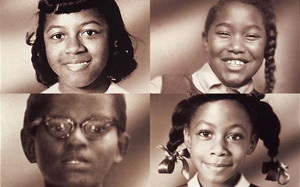 House and Senate leaders will honor four girls killed in an Alabama church bombing almost 50 years ago -- a crime that became a watershed moment in the civil rigthts movement. The Congressional Gold Medal went to Addie Mae Collins, Carole Robertson and Cynthia Wesley, who were all 14, and Denise McNair, who was 11. The ceremony came five days before the 50th anniversary of their deaths inside the 16th Street Baptist Church in Birmingham. "Their names remain seared in our hearts," said House Democratic leader Nancy Pelosi of California. She was joined at the commemoration by Senate GOP leader Mitch McConnell of Kentucky, Senate Democratic leader Harry Reid of Nevada, House Speaker John Boehner, R-Ohio, and members of Alabama's congressional delegation. Along with the many lawmakers in the crowd paying tribute were director Spike Lee, and several relatives of the girls. The girls were killed in the explosion of a bomb planted outside the church by white supremacists. The attack shocked the nation and helped spur passage of the Civil Rights Act of 1964 and the Voting Rights Act of 1965. Three Ku Klux Klan members were convicted of the bombing years after the attack and sentenced to prison. Two have since died; one remains in prison. The four victims of the Birmingham bombing are not the only children to be honored with the medal. Roland Boucher, 11, was awarded a Congressional Gold Medal for heroism in 1941 after rescuing five playmates who fell through the ice on Lake Champlain, according to a House of Representatives website on the medal. Since the American Revolution, Congress has commissioned gold medals as its highest expression of national appreciation for distinguished achievements and contributions, according to the House website. Earlier this year, the Senate approved the measure to posthumously honor the Birmingham girls on a voice vote. The House passed the bill by 420-0. Language in the legislation specifically recognized how the children's deaths marked a turning point in the years-long fight for equal rights for the nation's African American citizens. While Congress showed overwhelming support in awarding the medal, it has divided the victims' relatives. Some are supportive while others have said they would prefer financial compensation and have little interest in the award. Overlooking the podium at the ceremony in the Capitol's Statuary Hall was the statue of Rosa Parks, another hero of the civil rights movement who in 1955 refused to give up her seat on a city bus to a white man in segregated Montgomery, Ala. She was arrested, touching off a bus boycott that stretched over a year. Parks, who died in 2005, is among past recipients of the congressional medal, as are civil rights leader Martin Luther King Jr. and his wife, Coretta Scott King. Rep. Spencer Bachus, R-Ala., said the presence of Parks' statue was especially fitting, given the historic roles and the shared Alabama roots of Parks and the four girls. "They have joined her in history," said Bachus of the slain young girls. Sen. Richard Shelby, R-Ala., said the bombing was a "shameful day" that awakened America's conscience. But he lamented how long it has taken for the four girls to be honored by Congress. "I'm sorry it took 50 years," he said. The medal will be kept at the Birmingham Civil Rights Institute.